The Coleman Instant Northstar™ Dark Room 10P features our latest dark room technology, blocking out up to 95% of sunlight allowing the family to sleep longer and stay cooler. 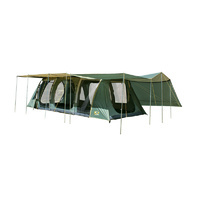 The instant up frame means that the tent can be constructed in under 3 minutes, giving you more time to enjoy your surroundings! I upgraded to this tent for 2 main reasons. I wanted an instant up tent, and this tent is definitely that. First time set up we set the timer and it took 2 min 43 sec for the base tent. Fly was about another 6 or 7 mins including poles and peg-in. These timings are based on 2 people doing it so would take a little bit longer with one person (but why would you buy a 10 person tent if you were camping solo?!) The other reason was DARKNESS, and this tent is almost pitch black in the middle of the day! Finally we get to sleep in when the sun comes up! I'm also really happy with all the vent holes to allow the breeze to come through as well as heaps of storage pockets. 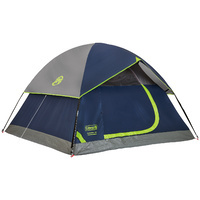 I was surprised at the internal height of the tent too as my family are tallies and most of the you tube videos didn't reflect how much standing height there was inside this tent which is very generous. 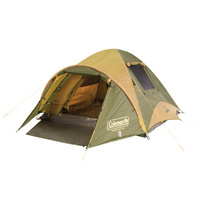 3 divided room areas are surprisingly generous and would actually sleep 9 people comfortably (not 6 as is the usual case in a 3 room tent). 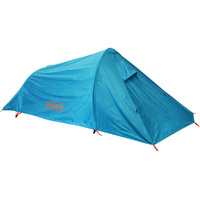 My only negative is when packed then tent weighs 30kg which is definitely a 2 person carry so I just purchased an inexpensive tent bag online and divided the load (ie put poles, pegs and fly in the seperate bag) as a I like to be independent and carry it to/from the car by myself! Otherwise so happy with my decision to buy this tent. 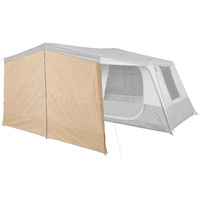 Perfect family tent and easy to set up. Such a great tent!! Easy to setup, easy to pack down. 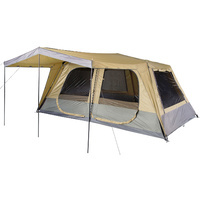 Its an ideal family tent. These guys were great and the tent looks good we grab the tent today in store were they had one on display which was refreshing.